Two video interviews with Peter Dille, Sony’s SVP of marketing. In the first video he talks about the new PSP Go and in the second video he talks about the new motion controller. Videoes taken from Gametrailers.com. 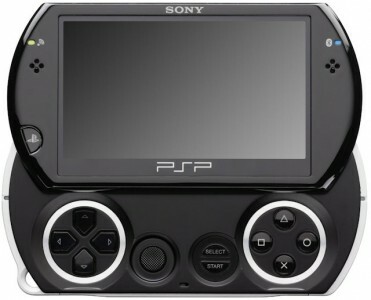 Kotaku have checked out the new PSP Go on E3. Sony showed their new Motion Controller for Playstation 3. It looked like it worked real well in the tech demos showed. You can watch the on stage PS3 demo in the videos bellowe. The new rumored PSP Go is indead real and video of it was leaked a bit early by Sony themself. It was in June edition of Qore (which you can buy from the US Playstation Store), they talked a bout the the new PSP Go which would have been shown for the first time on Sony’s press event Tuesday June 2nd. This Qore edition is now pulled from the Store. The big news with the new PSP is that is now lack a UMD drive, but have 16GB flash onboard instead and you have to slide to get to the controlls. 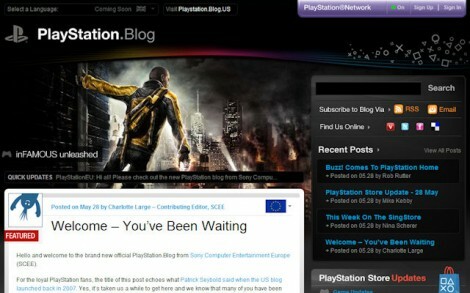 At last and long waited for, the official Playstation blog for Europe is opened. Just in time for E3. Go over to blog.eu.playstation.com. Hello and welcome to the brand new official PlayStation.Blog from Sony Computer Entertainment Europe (SCEE). For the loyal PlayStation fans, the title of this post echoes what Patrick Seybold said when the US blog launched back in 2007. Yes, it’s taken us a while to get here and we know that many of you have been asking for a European blog for a long time now. We’ve been listening and thank you all for your patience and support whilst we’ve been getting everything ready for today’s launch. Now that we’re here, it’s our hope that this blog will grow to become a one-stop-shop for your daily fix of PlayStation news from across the SCEE region. Like our US sister-site, we’ll be sharing with you all the latest PlayStation news, interviews, trailers, event coverage and much more with a European flair; everything will come firsthand from the people who work here at SCEE, in the development teams and across our third parties. This years E3 (Electronic Entertainment Expo) will be in Los Angeles June 2-4. That’s only one week away. The last couple of years, the show have been toned down. But this year, it’s back with a big show. Microsoft start it all with its press conference on Monday June 1st at 10:30AM PST, that’s 19:30 (or 7.30 PM) European time (like Oslo, Berlin, Rome). Check out timeanddate.com for your local time. Nintendo will have their press conference on Tuesday June 2nd at 9.00 AM PST, that’s 18.00 (6.00 PM) European time. Check timeanddate.com for your local time. WHAT: Consumers responded to Nintendo this year, as evidenced by continued growth of the Wii™ home video game system, record-breaking sales of the Nintendo DS™ portable franchise and the introduction of the newest hand-held iteration, the Nintendo DSi™ system. Nintendo will provide information about upcoming products at its media briefing, which kicks off the year’s biggest video game event, the E3 Expo. Sony will have theirs at 11.00 AM PST, or 20.00 (8.00 PM) European time, check timeanddate.com for your local time. Everything and more will be streamed live from different sources around the Web. According to xboxprimetime.com the following sites will stream live: Gametrailers.com, Gamespot.com, IGN.com and G4tv.com. You can also go to the same site for full coverage from E3 in LA. The creator of Metal Gear Solid, Hideo Kojima, held a keynote at a GDC (Game Development Conference) this week. Here is a seven part video of the keynote, taken from Gamespot.com.